Ice cream is by far one of my favorite things, especially in the summer. However- dairy bloat, sugar slumps, and crazy amounts of calories to enjoy said ice cream are not! You don’t even taste the avocado, it just adds a thick, creamy, rich base for your “nice-cream” and makes for a great dupe! 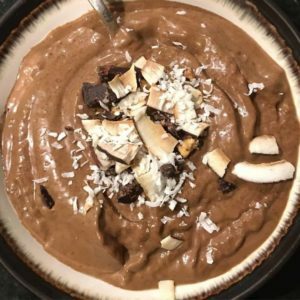 Not only is this recipe a great low calorie, sugar-free treat, it’s a nutritional powerhouse packed with healthy fats and antioxidants from the cacao powder and can be bumped up even more with the toppings you choose! Add avocado to the blender, followed by cocoa powder, stevia, and ice. Add your choice of liquid to blender (bring almost to the top of ice) and blend until smooth. That’s it! I just a bullet sized blender which is perfect for 1 serving. Top with your favorite healthy toppings like almond butter, toasted coconut, shredded coconut, and cacao nibs!